UPDATE 7/15/2016 11:49am EDT: Donald Trump has announced Indiana Governor Mike Pence as his running mate on Twitter. Of the likely contenders, Pence has the worst record on energy and climate change. When it comes to energy and climate, Donald Trump is as establishment as they come. For his energy policy speech last May, he regurgitated the American Petroleum Institute’s talking points. He has called climate change a myth and a hoax. And he insists that as president, he’ll revive the American coal industry while going full bore at fracking natural gas, a contradiction in terms. Trump has narrowed his focus to three Vice Presidential apprentices, so we thought we’d investigate what kind of credibility each of them gives the Republican nominee on one of the most important issues of our time. Pence is the least well known of the top three contenders, although some sources say he is the likely favorite. He was a longtime member of the House of Representatives and has been governor of Indiana since 2013. He’s known for being a staunch conservative and gained national attention in 2015 for signing a law giving businesses the right to deny service to LGBTQ people for religious reasons. Of the three top contenders, Governor Pence has the worst track record when it comes to energy and climate. 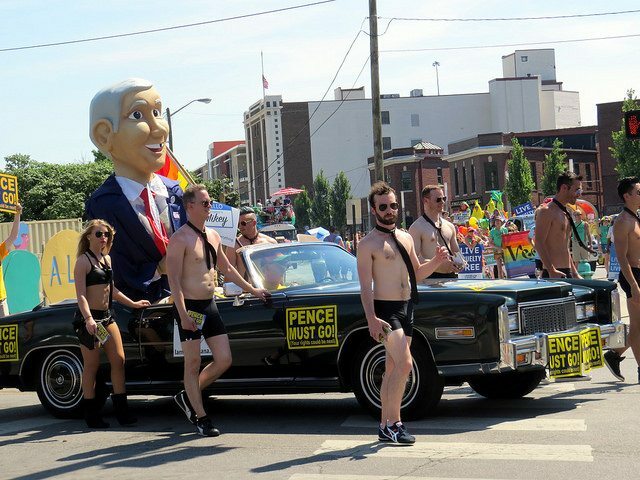 Governor Pence faced national fire and a recall campaign for his state’s anti-LGBTQ legislation. Photo from Flickr by Steve Baker. Gingrich is back, trying to recover some of his 1990s mojo. 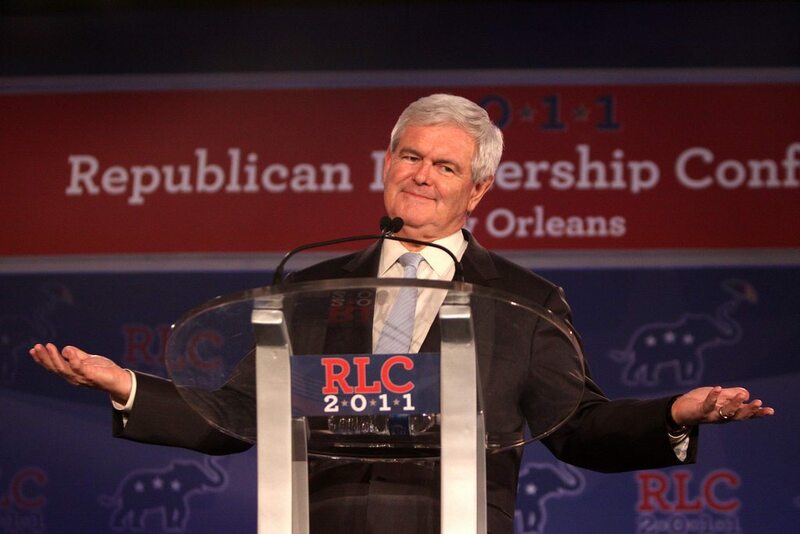 Unlike Governor Pence, Gingrich is sort of hard to pin down on climate. He’s slippery, usually playing off doubt and accentuating the controversy (which, by the way, is nonexistent among scientists.) He seems to accept that humans have had an impact on the planet (that’s going out on a limb for a Republican,) but hasn’t stated definitively whether he believes climate change is caused by people. He nearly included a chapter about climate change in his 2008 book Drill Here, Drill Now, Pay Less (really?) but it was removed because of peer pressure. The title of the book was not sarcastic, just in case you’re wondering. After the historic negotiations in Paris in 2015, Gingrich took to the conservative press to rail on President Obama for shirking “the present crisis of the real, observable world in favor of the abstract challenges of the predicted, distant future.” Never mind that every nation on earth had gathered there because all of them were really observing climate change right now. In 2006, Gingrich appeared in this national ad, sponsored by Al Gore’s Alliance for Climate Protection, in which he clearly states that our country needs to take action to counter climate change. So there’s that. In fact, he seems to have been conflicted about climate change for the last 20 years. He allows that the scientific evidence is there, but he doesn’t seem to think it should cost us anything or that we should go out of our way to avoid it. Which means as Vice President, he would support barreling into a catastrophe we all know is coming full speed ahead. Good leadership! As governor of New Jersey, Chris Christie should know better than anyone the impacts climate change is already having on Americans. At one point, Christie did actually acknowledge that climate change was real and caused by human activity. 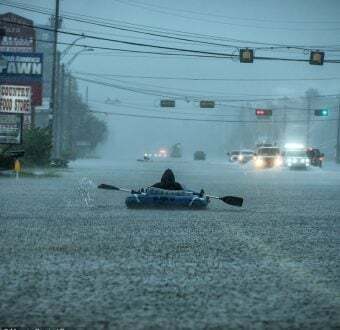 Yet, all the evidence points to a man who does not see it as a crisis and continues to cater to the fossil fuel industry while his home state deals with the devastating impacts. No wonder the Boss keeps giving Christie the cold shoulder. Christie took time away from the Trump campaign (and being governor) to see the Boss Bruce Springsteen. In the past four years, Christie has met with fossil fuel barons, including Jerry Jones and the Koch Brothers, advocated for the Keystone pipeline and an end to the U.S. oil export ban. All the while as governor, he ignores or actively opposes the clean energy proposals he championed during his run for office in 2009. The governor quietly agreed to settle a decade-long $8.9 billion legal battle with Exxon Mobil for just $225 million. ExxonMobil, in turn, donated $525,000 to the Republican Governors Association, of which Governor Christie was the chair at that point. The company’s donation marked the greatest cumulative amount since 2010 that Exxon has contributed to the association during a governor’s leadership tenure. Christie vetoed bans on allowing the disposal of wastewater from fracking in New Jersey and even pulled out of the Regional Greenhouse Gas Initiative, catering to fossil fuel lobbyists. So there you have it, the best Trump could come up with, a list totally in keeping with the man who would be, if elected, the only sitting world leader to deny climate change. Cassady is a media officer at Greenpeace USA covering the Arctic, climate change and corporate influence over politics. Jason is a media officer for Greenpeace USA based in New York City.